Mix the horseradish and crème fraîche. Season, cover and chill. Turn the oven on low and put a baking sheet in to heat. Sift the flour, salt, bicarbonate of soda and baking powder into a bowl. Make a well in the centre and beat in the egg, then the buttermilk and butter. Add about 100ml water to create a smooth batter that's about as thick as double cream. Put a heavy-based frying pan over a medium heat. Add 1 tbsp oil. When hot, spoon a blob of batter into the pan. Repeat until you have 4 pancakes of 8-9cm diameter. After about 2 minutes, they should be puffy and golden brown underneath. Flip them and cook for 1-2 minutes on the other side. Keep warm in the oven until all are cooked. Divide the pancakes between 6 plates. 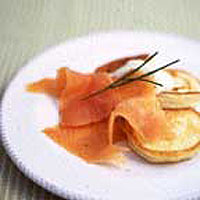 Add a blob of horseradish cream and 3 slices smoked salmon. Season with pepper, garnish with lemon wedges and chives or parsley and serve. This recipe was first published in April 2004.